Tall, thick haulms, a little less vigorous than PICASSO. 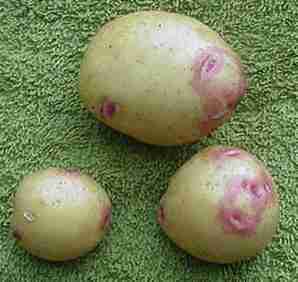 Susceptible to blight; about 3 on blight scale, but its flavour is renowned and outstanding. I used to work on a small mixed farm and we grew 2 acres of these every year; they sold out very quickly. In containers: Yield around 1.5 lbs per pot 2 gallon pot; 2.5 lbs per 3 gallon pot. White skin with red eyes; very pale yellow flesh. A floury potato (more so than PICASSO, which looks almost the same). Good boiled, mashed, baked or fried in oil. 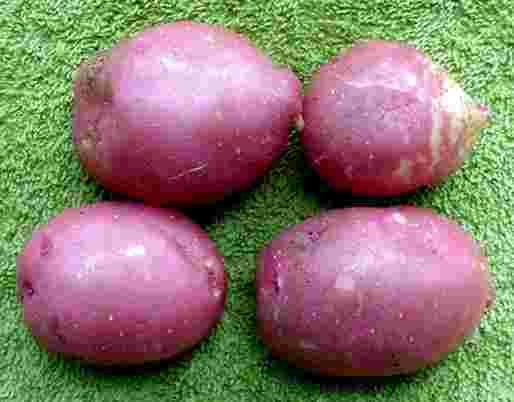 The variant RED KING EDWARD is a little more floury and for me produces higher yields; skin red which often covers the whole tuber but sometimes with white patches. I'm sure this often has flowers but my plants in pots had none.